Driving your car in bad weather is stressful no matter what the elements. "Science Daily" reported in 2008 that 24 percent of automobile accidents occur during bad weather. This, in large part, is due to drivers' failures to slow down, even in rainy, icy, or snowy conditions. Automobile and tire technology have evolved over the years to make cars safer in inclement weather. Drivers still have a responsibility to learn how to drive their cars safely when the weather turns sour, however. Don't become part of an unsavoury statistic of somebody who caused an accident by driving too fast or carelessly in bad weather. Drivers must worry about more than the thunder and lightning when driving in thunderstorms. In some parts of the country, severe thunderstorms precede tornadoes, and nobody wants to be on the road should one develop. It is critical to know what to expect when driving in thunderstorms, so tune the car radio to a weather station that will give the appropriate warning of any impending tornado activity. Also follow the rules of driving in the rain, even if the thunderstorm is a dry one. Turn on the car's low-beam headlights, slow down, and allow for extra braking distance should the cars ahead need to stop suddenly or get into an accident. If the thunderstorm becomes unruly, find a safe place to pullover away from trees, electrical poles, or any other potential falling hazard, turn off the car, and wait the thunderstorm out. The best approach for driving in a tornado is don't -- period. To go out during the threat of these wind tunnels is a no-win situation. Even if drivers are already out on the road and the weather shifts to a tornado threat suddenly, drivers still need to stop operating their vehicles. Tornadoes are highly unpredictable and can shift on the drop of dime; trying to race or out-manoeuvre a tornado is too dangerous to chance. Pulling over and staying in the car is also too dangerous to chance, as tornadoes can pick up and move cars miles away. Instead of attempting to drive away from a tornado, drivers should immediately seek the proper shelter, get out of their cars, and take cover until the tornado passes and it is safe to resume driving again. Horror movies have made fog a scary enough thing without having to drive in it. Depending on where people live or when unexpected temperature drops occur, driving in fog is a necessary and common condition. Drivers should keep in mind when driving in fog high-beam headlights actually make visibility worse, so always drive with the low beams on. Drivers should also crack their window just a little bit so they hear the traffic better -- fog suppresses sound. Always slow down in fog and definitely keep plenty of distance between cars; it's much harder to see brake lights until it is too late. Use the road's dividing lines or bots-dots as a guide to ensure the car stays in the lane, and never attempt to change lanes in foggy weather. It's best to stay put and keep moving forward, slowly and cautiously. Michigan State University: What Causes Fog? Hurricanes are another "just don't do it" when it comes to driving in bad weather. In many cases, however, drivers might be trying to get out-of-town before the storm strikes and simply do not make it. When driving in a hurricane, it is critical to have a plan before the storm ever hits. Prepare an evacuation plan during the hurricane off-season by mapping and driving all available routes from wet to dry land. During hurricane season make sure to keep the automobile stocked with emergency supplies, such as a first aid kit, non-perishable foods and manual can openers, water, a flashlight and batteries, a portable radio and batteries, and blankets. During hurricane season keep the car full of gas at all times and always have a fully charged cell phone on hand. Keep the car's maintenance in check to avoid breakdowns and when it's time to hit the road, drive slowly, cautiously, and avoid all potentially flooded areas. If drivers must drive or get stuck in a blizzard, many of the same rules apply as when driving in a hurricane. Safely driving in a blizzard means being prepared beforehand. Keep the car's maintenance up-to-date during winter months, paying special attention to the condition of tires and windshield wiper blades. Always keep extra antifreeze in the car, as well as the necessities listed in the "Hurricanes" section of this article; blankets are a definite must when faced with driving in a blizzard. Tune the car radio to a weather channel for updates on road conditions, and have a passenger use a fully charged cell phone to contact the area's authorities for road-condition updates. Let somebody know the route being taken and approximately how long it should take to arrive at the end point. This helps authorities if they must look for drivers who got lost in the blizzard's low-to-zero visibility. Keep the pace slow and a wary eye on all of the vehicle's gauges to make sure the car is operating properly through these very dangerous conditions. Drivers who get stuck in the blizzard should make sure the exhaust pipe is clear of snow and debris to avoid carbon monoxide poisoning. Cars and their passengers are more vulnerable when it's raining outside. Water mixes with oil on the roads and highways and turns them into a slip-and-slide of disastrous proportions. People need to slow down in rainy weather, and many don't. This is why there are so many accidents when it's raining outside. Driving in rainy weather requires a bit of patience and a lot of common sense. Slow down, turn on the headlights, don't follow too closely, and don't make unnecessary lane changes or turns. Keeping the car tires on the road helps prevent accidents, and when drivers are driving too fast or make sudden changes in direction, the car tires can separate from the road and cause what is called hydroplaning. Should the car begin to skid or hydroplane while driving in the rain, take the foot off the gas and carefully try and turn the car to right the vehicle. Do not brake if the car has traditional brakes; gently brake if the car has an anti-lock braking system. Always keep the car's maintenance up to date and tires properly inflated, as this avoids breakdowns and accidents in the rain. Those living flood zones know the dangers of flash floods and how quickly they can turn a car into an unwilling boat. 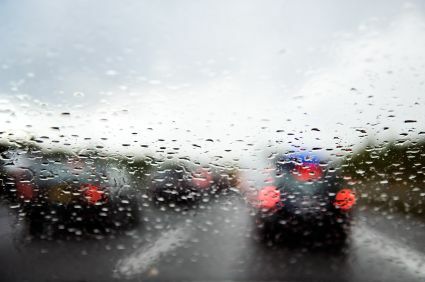 Use all precautions when driving in rainy weather and avoid continuing down any road that has water on it. Flooding is deceptive on roadways, and what looks like only a few inches of water can actually be 1 foot, which is very capable of turning the car afloat and sweeping it away. Water can also stall a vehicle and, as discussed in the "Rain" portion of this article, is a continual cause of losing vehicular control. Do not take for granted that a car will keep everyone safe in a flooding situation. Rather, think as if everyone was on foot and head for higher ground until the flooding subsides. With flooding, and any other type of weather hazard, it's best to stay off the road. Never drive in any inclement weather unless it is absolutely necessary. Compare commercial auto insurance Commercial Auto Insurance Quotes for Business Vehicles, including trucks, trailers, cars and vans. Quick & easy-to-use service, with no cost or obligation. Compare rates for large parts of Canada. Visit us today! Soumission d'assurance vie Avant que l'hiver n'arrive, tout le monde devrait penser à souscrire à une assurance-vie. Pourquoi? Tout simplement parce que les mois de décembre, janvier et février sont ceux au cours desquels les décès sont les plus fréquents. Aviva car insurance quote Aviva, a member of Aviva Canada Inc., has been insuring Canadians for over 50 years. Aviva employs more than 3,000 employees via their more than 30 locations Canadian locations. Aviva provides a broad range of insurance products and services, including auto insurance, to policyholders through a network of independent insurance brokers. Car insurance Nova Scotia Kanetix offers Nova Scotia vehicle insurance quotes from many of Canada's top auto insurance companies. Compare online auto insurance quotations in The Land of Evangeline and determine how much you can save. Comment obtenir la meilleure assurance vie? Grâce à Kanetix.ca, vous pouvez trouver la meilleure assurance vie au Canada, puisque le service offert vous permet de comparer un grand nombre de soumissions offertes par les assureurs les plus éminents au Canada. Notre service est gratuit, rapide et super facile à utiliser. Free car insurance quotes Kanetix was the first online insurance comparison service, and was established in 1999. You can compare auto insurance quotes for free using the Kanetix online quoter. Medical travel insurance quotes Save on your travel insurance with Kanetix; Canada's most popular destination to shop for your travel insurance. Get instant quotes from top travel insurance companies. Waterloo Ontario car insurance Kanetix compares Waterloo, Ontario car insurance rates from Canadian insurance companies. If you have had your car stolen in the past six years your premiums are likely more than $2500. Find competitive tri-city rates at Kanetix by using our free comparison service. Best life insurance Term life insurance typically offers you the most coverage for the least amount of money, and although there is no investment or saving component, there are many who would tell you to "Buy term, and invest the difference." Life insurance BC Compare British Columbia term life insurance quotes online instantly from some of Canada's top life insurance companies. Free, no-obligation life insurance quotes for Pacific Province residents. Prix assurance auto Comparez les soumissions d'assurance voiture des meilleurs fournisseurs d'assurance auto du Canada. Économisez 600 $ en moyenne sur votre assurance auto. Économisez temps + argent. Obtenez vos soumissions & demandez votre couverture en ligne aujourd'hui ! Assurance vr Kanetix: Comparaison simple, rapide & gratuite des soumissions assurance VR, caravanes, véhicules récréationnels, camping car & motorhomes. Économisez temps & ARGENT en visitant Kanetix! Auto insurers Looking for a cheap alternative to your present car insurance company? Spend a few minutes with Kanetix where you can instantly compare car insurance quotes from competing insurers. Assurance Auto Quebec Comparez les soumissions d'assurance voiture des meilleurs fournisseurs d'assurance auto du Canada. Économisez 600 $ en moyenne sur votre assurance auto. Économisez temps + argent. Obtenez vos soumissions & demandez votre couverture en ligne aujourd'hui ! Auto Insurance Ottawa About 8 percent of Ottawa drivers lease their car, and the other 92 percent own their cars outright. These drivers all have one thing in common: they all need competitive insurance coverage. The Kanetix Ottawa comparison service can help drivers who are looking for the cheapest car insurance rates. Auto Insurance Mississauga Kanetix compares Mississauga car insurance rates from Canadian insurance companies. Compare auto insurance quotes in Mississauga today. You could save a considerable amount of money your on insurance policy. Assurance auto Laval Kanetix permet aux habitants de Laval de comparer gratuitement plusieurs assurances auto compétitives pour économiser le plus d'argent possible.